After the Eagles opener, I wrote about their “funky silent snap count,” where Todd Herremans looks back at the quarterback, taps Jason Kelce when the quarterback is ready, and then Kelce uses head-jerks to give notice that he’s about to snap the ball. I noted that the Eagles only went on something other than one head-jerk once that game, and I wondered how much they would mix it up as the season progressed. So far, the Eagles have used that snap count in every road game, and in Denver, they again used it (by my count) only once. Then this week Sheil Kapadia wrote an excellent breakdown of how Mike Patterson disrupted the Eagles’ zone running plays with a “nut stunt.” Sheil also noted how well Patterson was timing the snap at times … and that made me curious about how much the Eagles were mixing the snap count that game. In the second picture, no Eagles have even reacted to the snap yet! 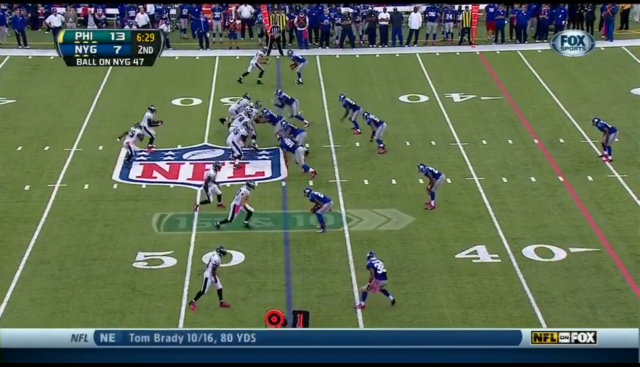 Contrary to what Patterson’s incredible jumps suggest, the Eagles mixed it up much more against the Giants. The Eagles went “on two” on the very first play, and proceed to do so to a total of 9 times that game, after doing so only twice in the previous two road games combined. 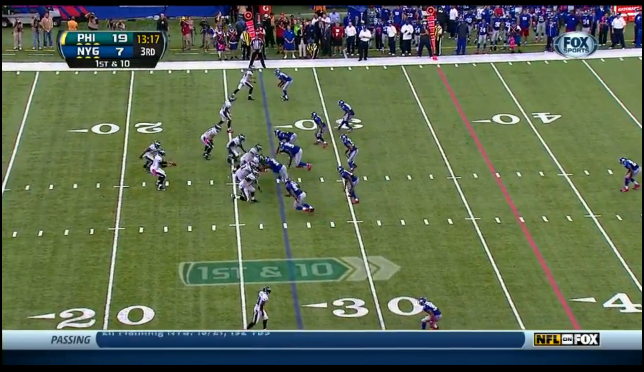 What I found most incredible is that in the 11 instances the Eagles went “on two” this season, they have 4 false starts! And they even got away with a false start on one of them, as in the Giants game, LeSean McCoy started to lean, but turned it into an “oh I’m actually just going over to check something with Vick” and the officials didn’t call it. The play would eventually be negated by a Kelce hold anyway. 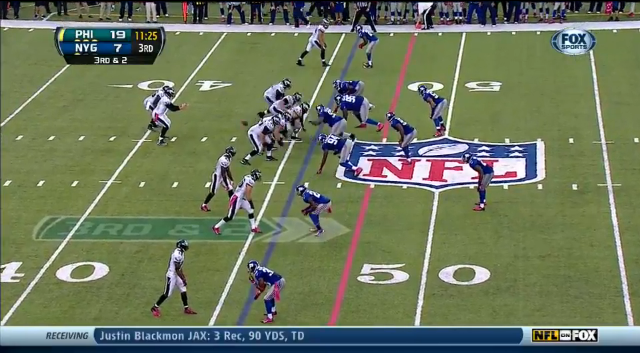 So the Eagles have false started on 5 of their 11 “on two” plays. I think my middle school team had a similar rate. Maybe that’s why they’re not mixing it up much. Actually, I’d guess it just has do with going “on one” being quicker. Tempo, tempo, tempo! Even at home, where the quarterback says the snap count aloud, the Eagles don’t use a true cadence (“Blue 42, Blue 42, Set Hut!”). Instead, “Ready, Go!” suffices. Also of note is that in those 11 plays, Jason Kelce has had two opportunities to create a free play by snapping the ball after a defender jumped into neutral zone. I wonder if the coaches don’t want him looking to do that. There is some risk (if the defender gets back and quarterback isn’t ready for snap, or if the officials simply miss the call), but free plays are always nice, right? If the pattern of using this silent count in road games holds true, the Eagles will be using this method again in Tampa Bay tomorrow. Curious to see how much they mix it up, and how well they avoid false starts.